Tinning Street presents Tateru, an exhibition of sculpture by Paul Gorman and Takahiko Sugawara. Paul Gorman is exhibiting several photographs. Why is a sculptor exhibiting photographs? Although the photographs are not simply documentary images of Gorman’s sculpture, they do document ephemeral sculptural moments, moments of space and form. Ring of Confidence is a time-lapse photograph of the movement of light around a tree creating a sculptural form. This is why, in art-speak refers to contemporary sculpture as ‘spatial practice’ because it is art that uses three dimensional space. 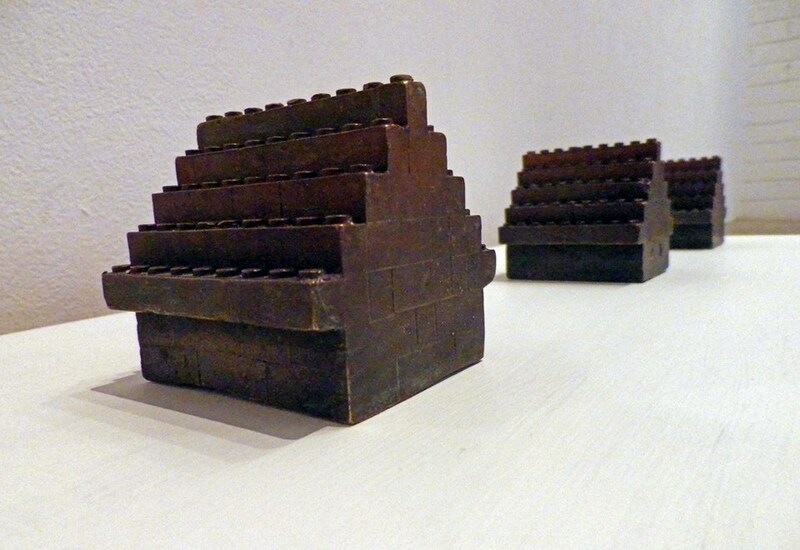 Home Built; Lego House (1,II, III) are three simplified blocky familiar forms cast in bronze. It is Gorman’s sculptures of houses in his exhibition really hit me because I was thinking about the suburbs with all the neighbourhood events on the day I visited. (For more about that day read my post Neighbourhood.) Although Jason Waterhouse has covered similar territory with sculptures, Gorman brings his lyrical and critical thinking to the subject. The dozen sculptures of Takahiko Sugawara are post-minimalist, made up of small wooden pieces that brought together create complex rhythmic waves like a composition by Steve Reich. These are mostly wall works and a couple of small free standing block sculptures that take the post-minimalism back to a minimalist cube. Apart from variations in size or shape Sugawara’s sculptures are of such an even quality that my attention was drawn to a large wall piece, Circles wondering why it didn’t work as well as the others. 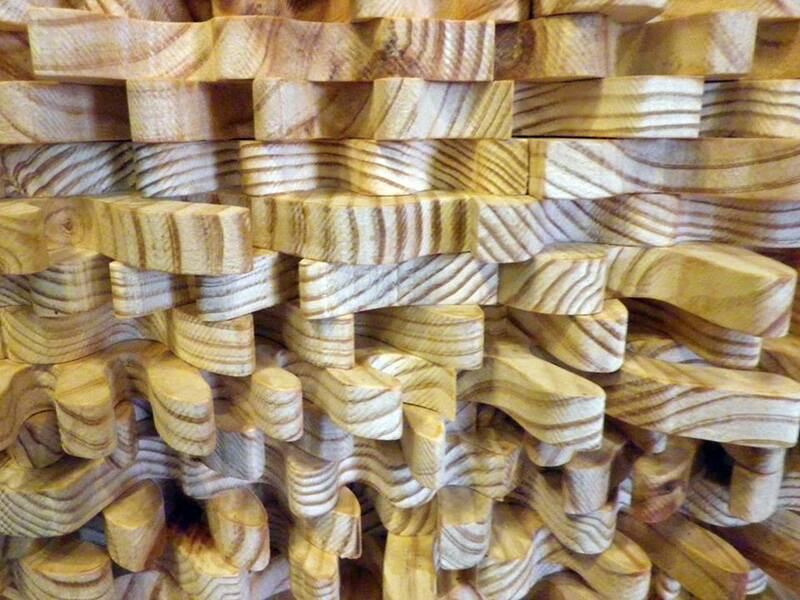 It’s flatter and the roughly circular pieces of pinewood are a less definite form. Putting these together lacked both the rhythm and the geometric complexity of Sugawara’s other sculptures. Although both Gorman and Sugawara’s sculptures are very different they find a harmonious combination in this exhibition. Both Gorman and Sugawara are members of the committee of the Contemporary Sculptures Association.